This green smoothie will be a real blessing to your body! It will give you such energy that you might even dance an Irish jig! 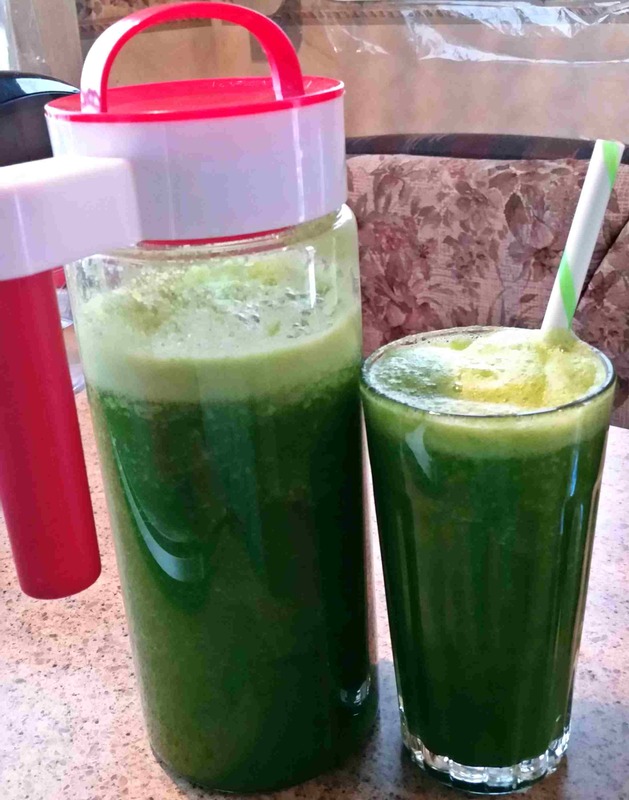 Move over Shamrock Shakes and green beer, the Super Green Smoothie is here! This recipe makes enough for a jug to share with friends and family, or drink yourself for a few days. Tip: When making green smoothies, I always make a big batch enough for a few days. It saves time and fuss! Spring is here, and it’s time to kick off the cleansing! Nothing is more cleansing and building to the body like leafy green vegetables! Depending on the size of your blender, you might need to do this in a couple of batches. I’ve got a Blendtec, which I absolutely adore and it has a big jug on it, so all this fits in there! Here’s the basic ‘recipe’. You can adjust it a bit to your own liking. Wash and cut your ingredients, then place them in the blender in the order they appear. When blending, liquid should always go in first, then soft stuff, then leafy stuff, then finally the harder or firmer things like frozen fruit, ice, hard vegetables like carrots, cucumber, etc, go on top. Blend until it’s smooth with no leafy bits. It’s no fun having to chew something you’re supposed to drink! If you’re new to drinking green smoothies and would like a sweeter flavor, you can substitute some of the water for orange or apple juice, or add more fruit and less greens. Sometimes I also like to add a small piece of ginger to aid in digestion and add a little pizzazz! and may you add some green to your life every day – green veggies, that is!